Powder rooms are similar to bathrooms except they usually lack a shower or tub and they focus on having a stylish vanity/sink. This is a practical room where there’s no need for a lot of space. That doesn’t mean you should leave the powder room neglected in terms of decorations and overall style. A fresh design can transform this place and help to entertain your guests. They will definitely be surprised if they expect to find a basic powder room only to discover an exquisite room that’s beautifully designed. Given how guests will most likely use the powder room before checking out other rooms, it’s a good idea to make a solid impression here. 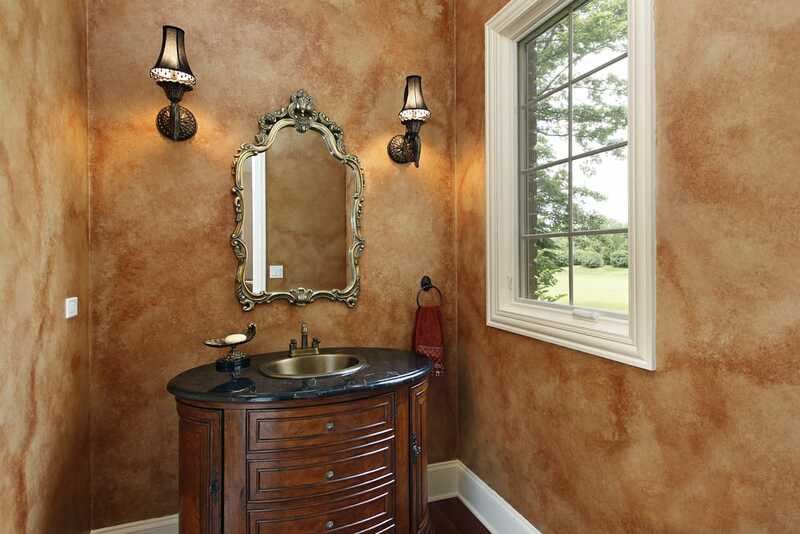 The look of the powder room can reflect your personality and creativity. While being a comfortable and practical space matters a lot, this room should also come with enhancements in the aesthetics department. If you need some inspiration, check out our innovative ideas for powder rooms that stand out and offer a memorable experience to any guest. The right mix of new and old elements makes this powder room seem quite eclectic. Whereas other rooms can maintain a more uniform theme, it’s a good idea to get a bit more creative with the powder room. That can mean combining different styles for a quirky impression. If you have a generous budget, the half-bath can certainly make use of a luxurious makeover. A few well-chosen elements and accessories can add a high-end and expensive feel to this room. The elegant ornate mirror in this powder room is a great example as it takes your mind to the Gothic Victorian design style. 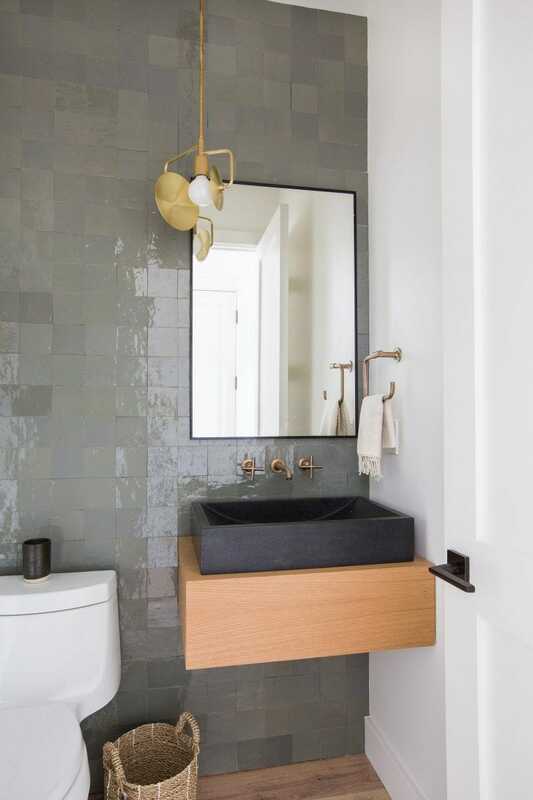 Brass elements are beautifully mixed here considering the integration of the sink and soap dish that respect the same design principles as the mirror. Their metallic shine stands out even more on the black marble countertop. One of the first things that you can modify when it comes to doing a powder room makeover is the look of the walls. Trying out some playful colors or patterns can add some much-needed visual interest to the area. This half-bath has some vintage elements that look very beautiful against the patterned red backdrop created by the walls. 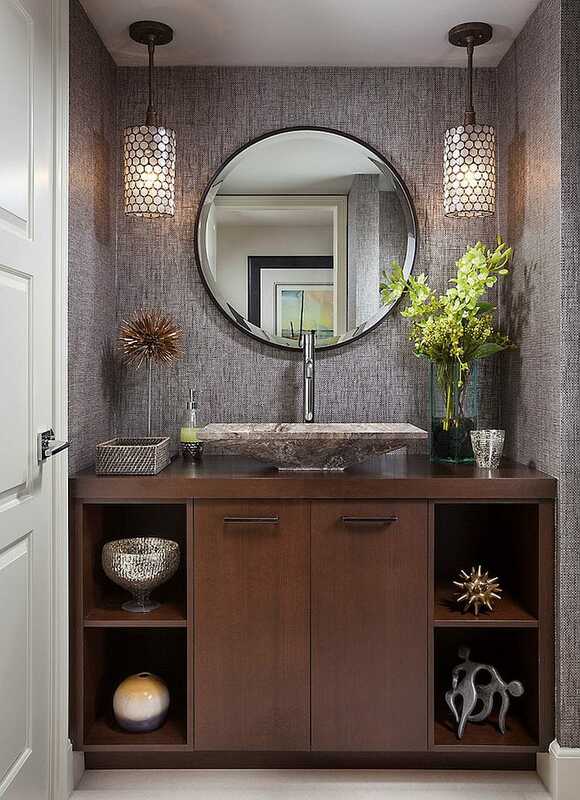 The powder room can make use of some beautiful artwork to make the atmosphere more pleasant. This picture illustrates a perfect example when you consider the combination of the antique elements of the half-bath with the elegant art that decorates the wall. Even though the color scheme and overall style feel simple, the resulting look is quite distinctive. 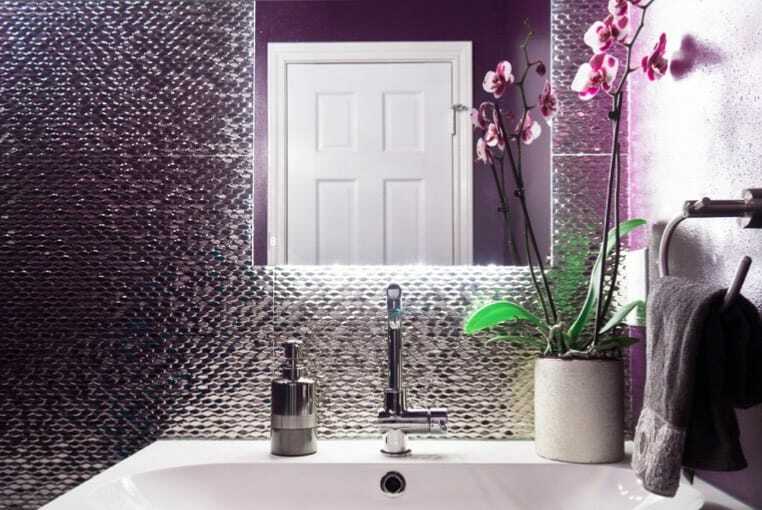 Purple isn’t usually the first choice when it comes to decorating a bathroom or a powder room. You can use this to your advantage and create an unexpected feeling for your own half-bath. The small space in this powder room is elevated with the help of the purple wall paint. Thoughtful accessories such as the matching orchid complete the overall bold impression. Another way to deal with a small area and boost the illusion of extra space in the powder room is to go for an all-white makeover. 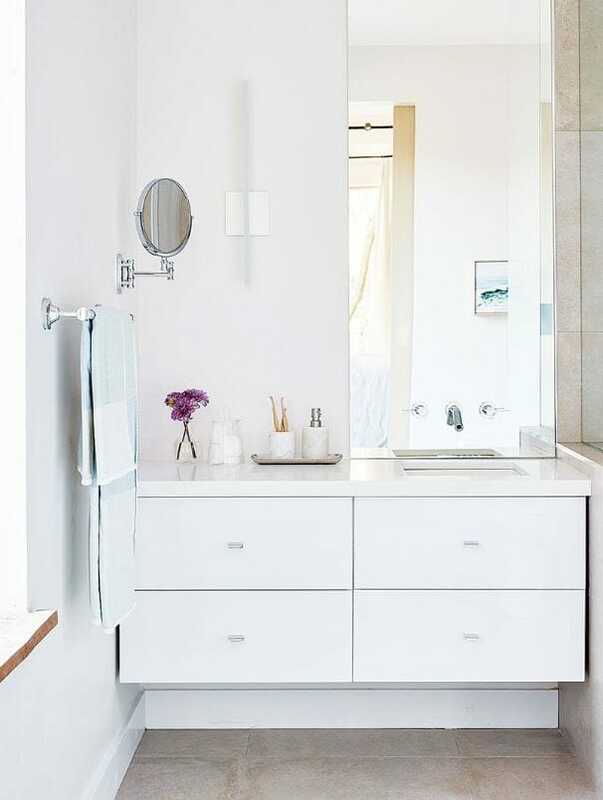 This is a superb example given the clean look of the white vanity. An oversized mirror takes the larger space trick to a new level and finishes off this stylish and modern look. If you wish to make your powder room stand out, but in a subtler manner, perhaps going for an elegant accent would be a smart solution. This half-bath uses marble tile to give off some palace style vibes. The walls are nicely accented as the marble sparks visual interest to create a memorable backdrop for the large sink. We also love how grey and white are perfectly balanced in this room. It’s not easy to decide on a specific theme for a powder room. One inspiring idea to try is to add some tropical vibes with the help of exotic elements such as bamboo walls. This unique-looking half-bath creates a delightful ambiance that’s casual and elegant at the same time. The bare wood floor makes a great impression together with the live orchid plant, but the real highlight is the mother-of-pearl shell basin. When it comes to architectural elements, there are many interesting options to incorporate in a powder room. 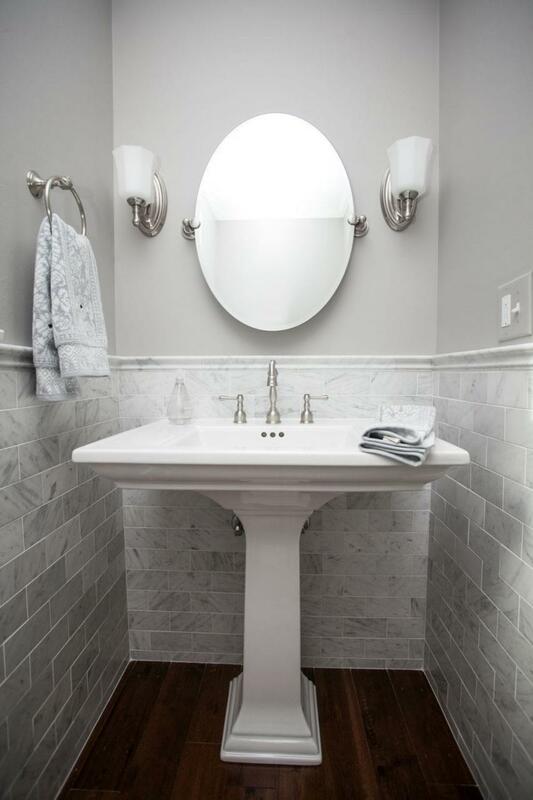 Take a look at this floating limestone washstand in this stunning half-bath. It’s designed to showcase the dark brass plumbing that matches the upper hardware. By choosing limestone, you are not just able to create a more stylish impression visually, but also in terms of texture as this material feels really nice to the touch. Other notable elements of this half-bath are the curvy shapes of the vertical light fixtures and lantern-style cement tile. Fans of clean retro designs will probably appreciate the look of this powder room. It makes use of a high-tank toilet which could be easily considered the strongest contributor to the retro atmosphere. This design choice is also great when it comes to the use of space as it’s more efficient to place the tank in this way. It’s a solid method to boost the spacious feel in the area. 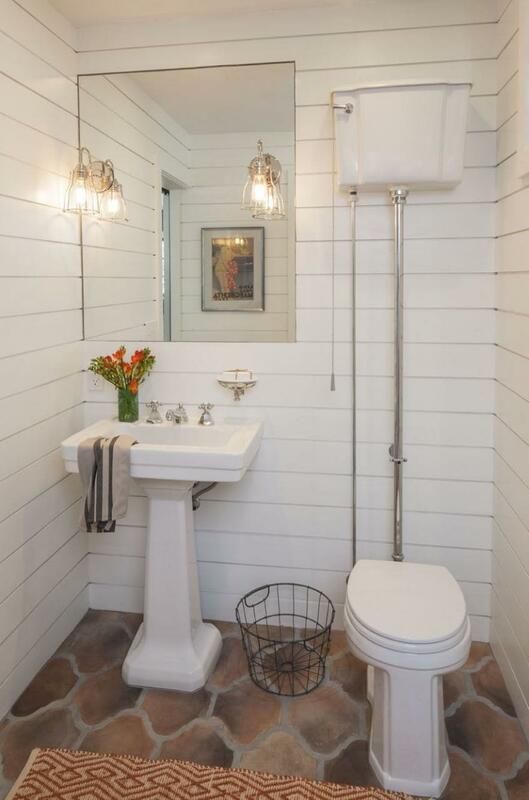 Thanks to the shiplap wall paneling, this powder room feels more welcoming and pleasant. For a one-of-a-kind half-bath you should definitely invest in a stylish tile like this geometric model. 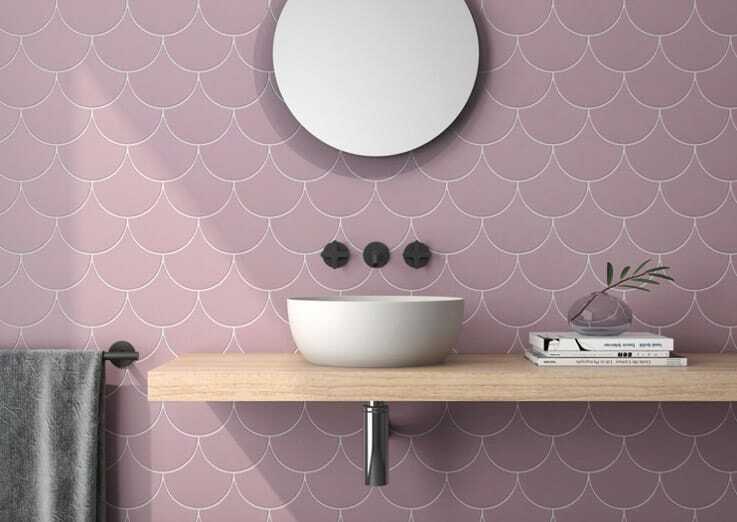 The playful use of patterns in the powder room creates a better visual effect when paired with a touch of color like the fashionable lilac hue in this example. Even if this type of tile can get expensive, powder rooms won’t usually require vast amounts given the smaller nature of this area. You can make quite the bold statement without going over your budget. A quick and simple solution to boost the alluring ambiance in the powder room is to try out some moody lighting fixtures. This is recommended to do when you’re dealing with very limited spaces where natural light isn’t present. 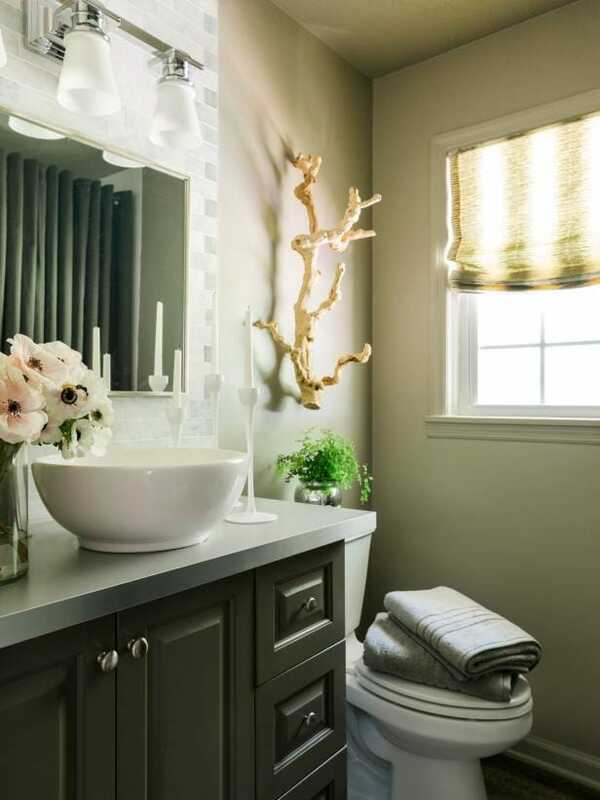 Take a look at this stylish powder room that takes advantage of metallic accents and cozy lighting to deliver a pleasantly warm feel to the area. Getting a functional mirror is important for both the bathroom and powder room. That being said, your half-bath can take advantage of a more aesthetically pleasing mirror like this premium oval model from Amazon. After all, you won’t be using the powder room to get through your morning routine as that’s a job for your bathroom. The half-bath is a good space to splurge on a fashionable mirror with a more interesting shape. 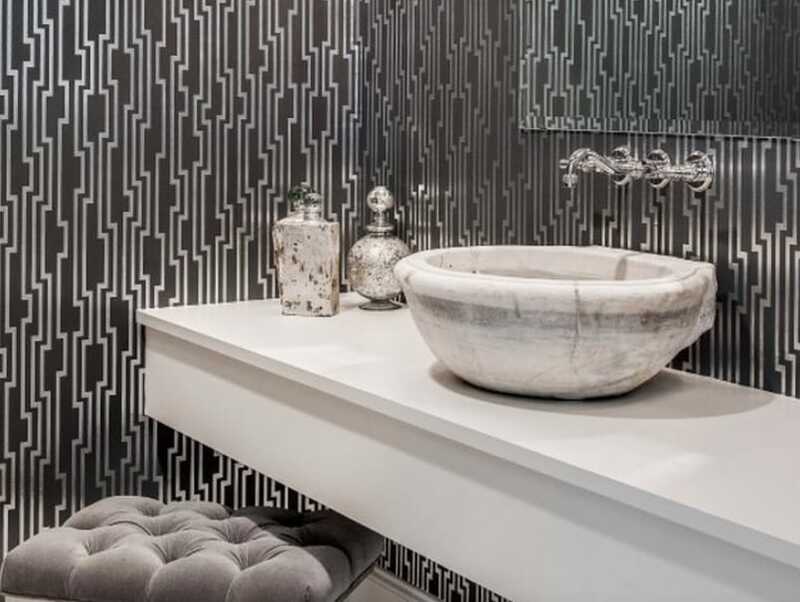 Some velvet, marble, and a metallic wallpaper – these are the right ingredients to add a glamorous touch to any powder room. If you wish to make a strong first impression, go for more innovative wallpaper designs like this patterned look shown here. It’s recommended to choose a water-resistant wallpaper to avoid any issues with splashing. Another good idea is to try removable wallpapers instead of more permanent options. This could be an important aspect if you live in a rental home. For those unconcerned about budget limits, this black and gold powder room can provide great inspiration. There are many elements in this half-bath that set it apart from the rest creating a truly refined regal look. 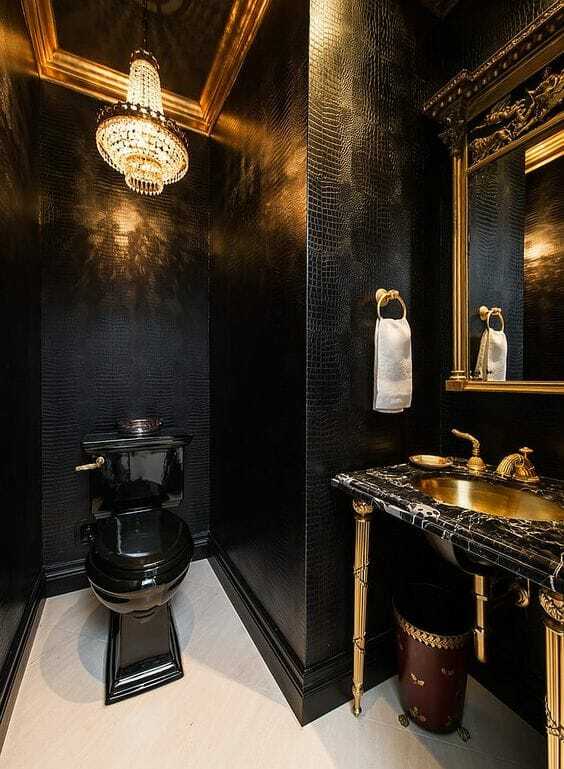 One of the stand-out features is the chandelier above the jet-black toilet and the imposing gold mirror. Everything in this room, from the textured black walls to the details on the gold accents, contributes to an exquisite ambiance. In case you’re not decided about the right style for your powder room, why not combine multiple design ideas and create a unique look? This is most likely what the designer of this half-bath had in mind considering the eclectic vibes from combining different elements. The first one that captures the attention is the big farmhouse-style sink. Its vintage effect is toned down with the help of an eye-catching mirror with a modern brass frame. The beach house style is thrown into the mix as well thanks to the addition of white shiplap wall paneling. Painting the entire walls in a bold color might seem too extreme for some people’s tastes. The effect in a small room like the powder room could be even more overwhelming. A simple compromise is to combine wall painting with white paneling to add some much-needed contrast and extra texture. 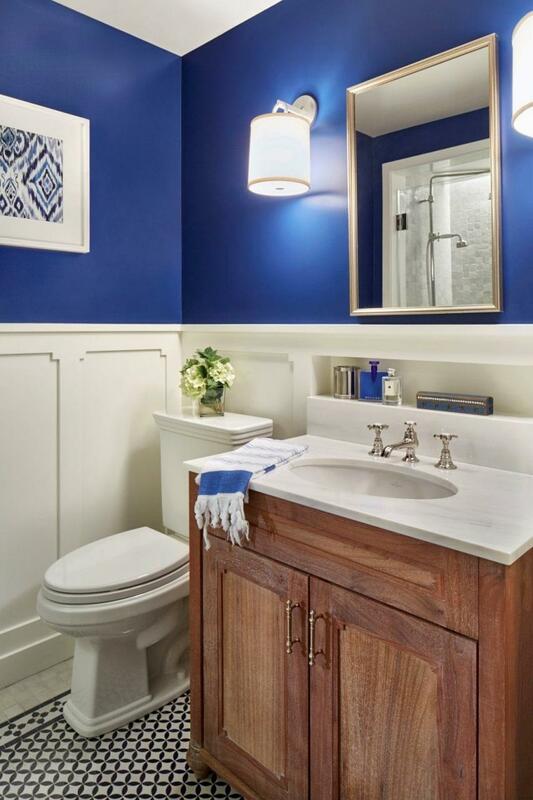 The royal blue wall in this half-bath makes a fairly bold statement, but the overall look stays balanced thanks to the wall paneling. To finish off this timeless look, the only element needed would be a traditional tile and marble combination for the vanity section. 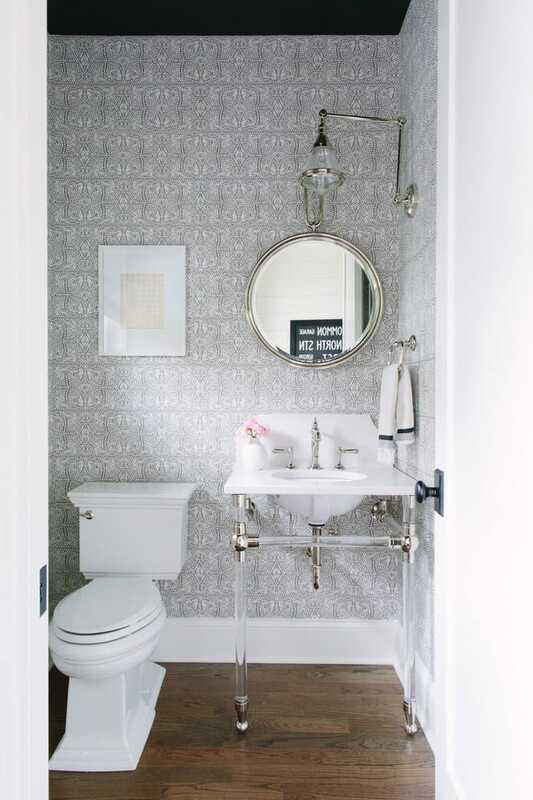 By including a floral print in your powder room you can breathe new life in this small space. Go for colorful botanical patterns to enhance the look of any half-bath making it seem livelier and more welcoming for your guests. Similar to other rooms in your house, the powder room can benefit from layered lighting if you want to obtain a well-polished look. Lighting can make a huge difference when used correctly. Try more innovative lighting combinations to spark some visual interest in this area. The trick is to use lighting that’s both functional and fashionable. Layered lighting achieves multiple purposes so while a central pendant fixture takes care of your main lighting needs, wall sconces or candles enhance the overall atmosphere. Pick warm light bulbs when deciding on the right ambient lighting solution and opt for cooler and brighter bulbs to handle functional lighting. 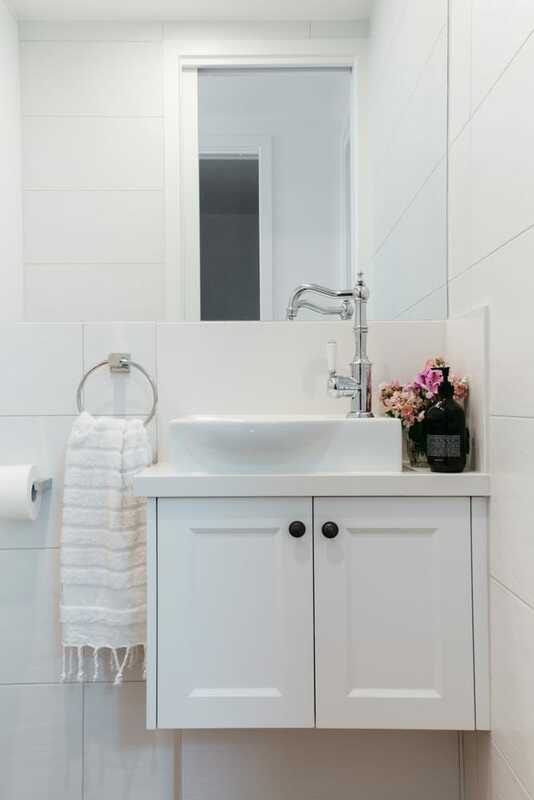 We’ve seen many fancy-looking powder rooms so far, but there are a few minimalist-themed half-baths that are also worth your attention. The one showcased here is a nice example as it lacks even a proper vanity. There’s just a simple marble basin with some sparse antique furniture pieces. Using a combination of warm wood and clean white tones makes for a pleasant balance providing this powder room an effortless design. 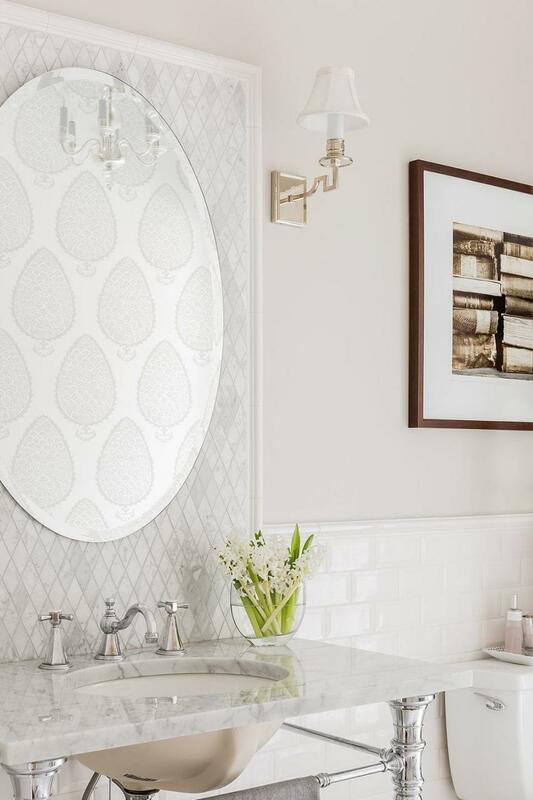 Mixing patterns in one place doesn’t usually sound like a good idea, but if we’re talking about a small space like the powder room, this might actually add a nice effect. The patterns on the floor clash against the ones on the wall of this half-bath resulting in a dazzling impression. The neutral color scheme is perfect for showcasing the different layers of patterns. If you’re out of ideas regarding the color palette of your powder room, why not try out a subtle yet impactful color choice like the olive-green shade in this half-bath? Thanks to the neutral style of the green color, the room doesn’t feel overwhelming or bland. It delivers the perfect balance of lush tones to create a harmonious look. To add to the fresh feeling of the powder room, there’s also an interesting accessory like the coral that decorates the wall. Together with the plants, the coral contributes to the natural beauty effect of the room. 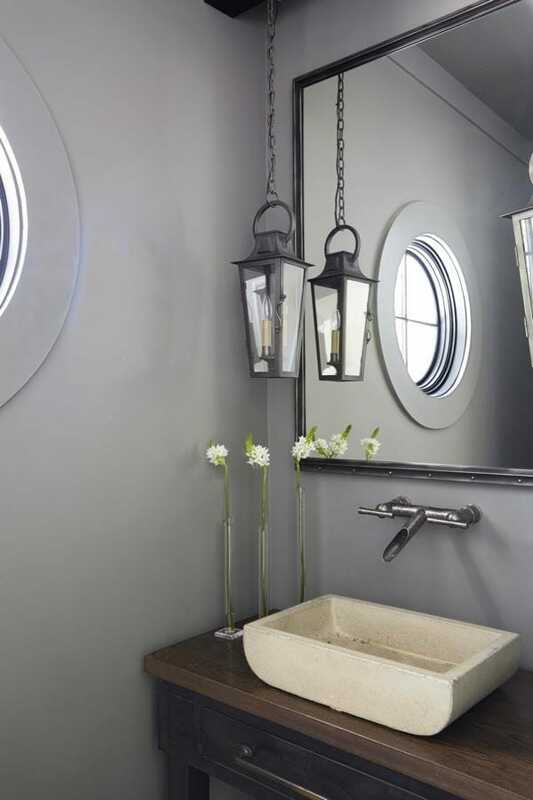 Overall, the dominant olive color represents an excellent choice for this powder room given its calming quality. 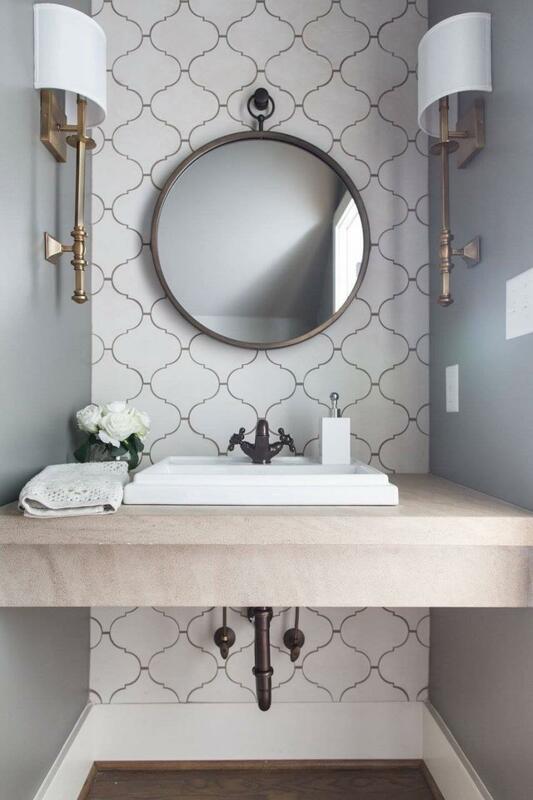 The right pattern choice can transform a simple powder room into an important highlight of your home. This half-bath features a golden trellis accent wall that’s capable of drawing the attention of any guests who enter this room. Combined with the elegant chandelier above and the stylish mirror, the final impression is simply stunning. These patterns can easily take your mind to the exotic style of the Moroccan design. For those who aren’t fans of vintage or traditional styles and are looking for something with a bit more oomph, perhaps an ultra-modern makeover would be a better solution. 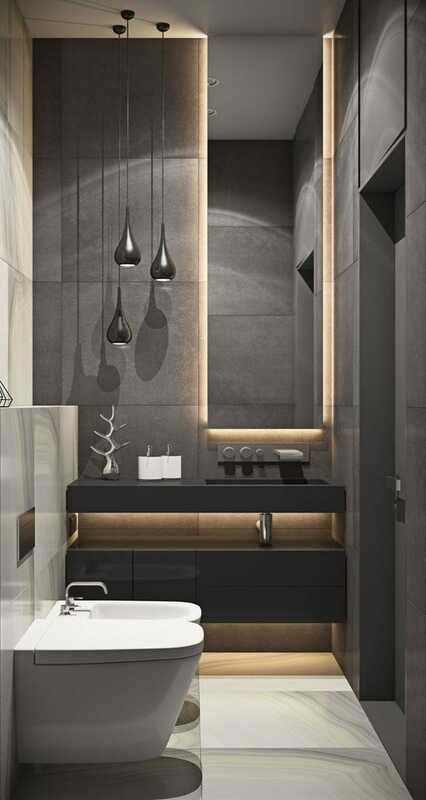 This sophisticated-looking powder room has all the features needed to belong in a very modern home that exudes cosmopolitan luxury. This predominantly grey powder room gives off some business, no-frills vibes. It’s designed to be stylish yet subtle in terms of design features, without making bold statements through loud colors or vivid patterns. Functionality is also better emphasized through the addition of diverse lighting options. 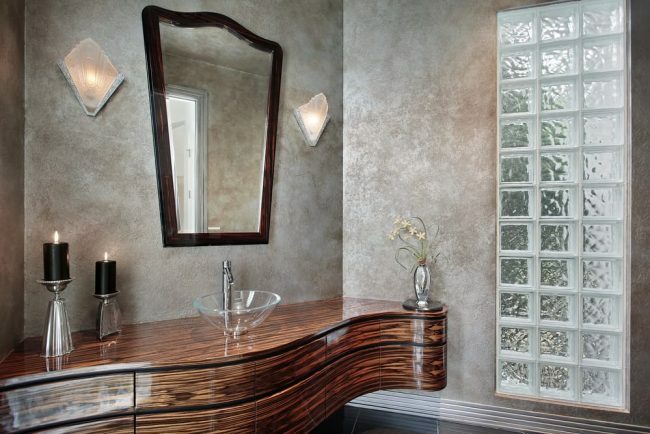 This upscale powder room is another solid example that seems promising for fans of glamorous looks. 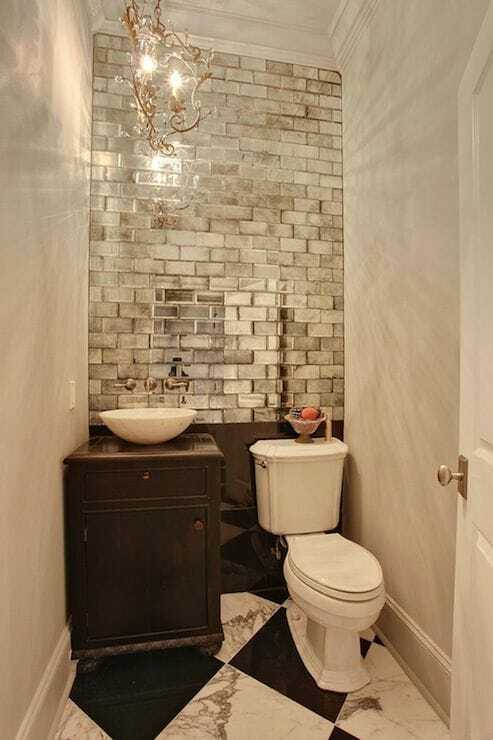 The stand-out feature here is the tile work which sports some unusual characteristics as the subway tiles offer an intriguing mirror design. Despite the small size of the room and limited furnishings, the overall impression here is one of luxury. The intricate lighting fixtures contribute to that visual effect as well. There are lots of ingenious design elements you can try to incorporate into a powder room to impress your guests. One of our favorites is the floating sink. It’s a perfect addition to this small area given the need to boost the sense of space. Another great aspect to take into account if you opt for a floating sink is the gaining of extra storage space. 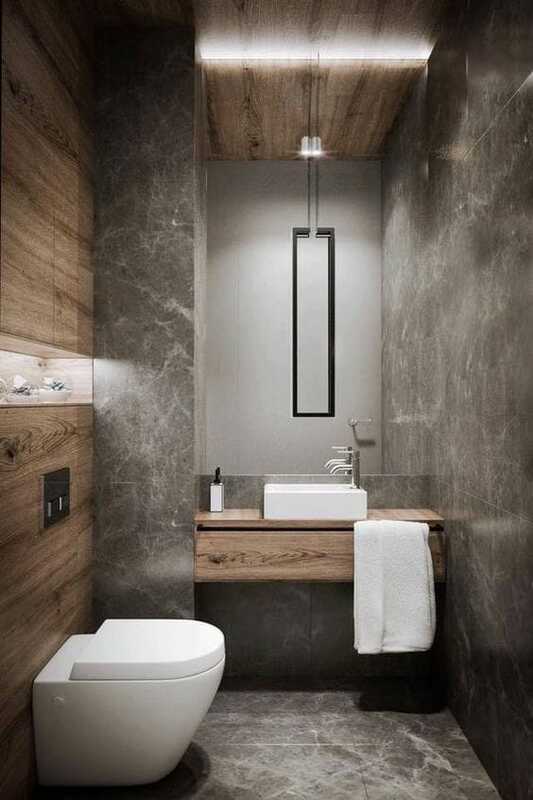 This could be an ideal design element for trying out a minimalist style in the powder room. 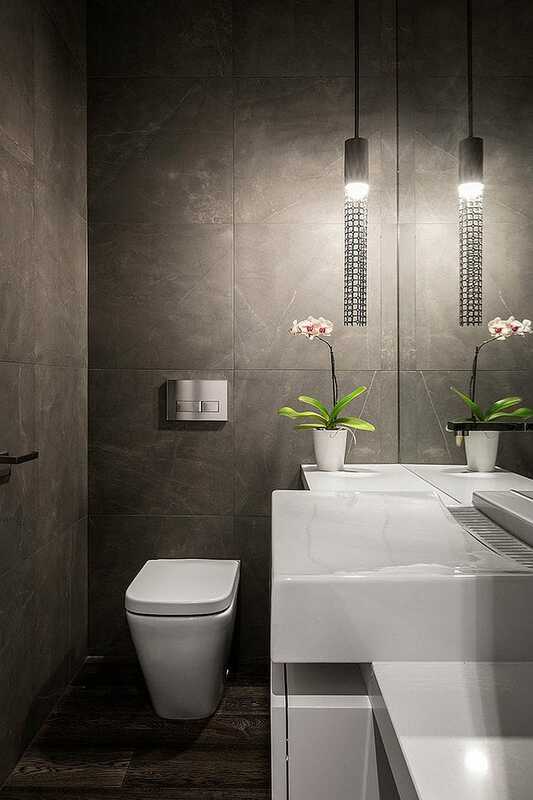 The color grey can be a very suitable option for ultra-modern powder rooms, but that doesn’t mean vintage-styled half-baths can’t take advantage of it as well. This picture provides good proof of that. Elements such as the repurposed console table and carriage-style pendant light combine with the elegant grey of the walls for an amazing visual effect. 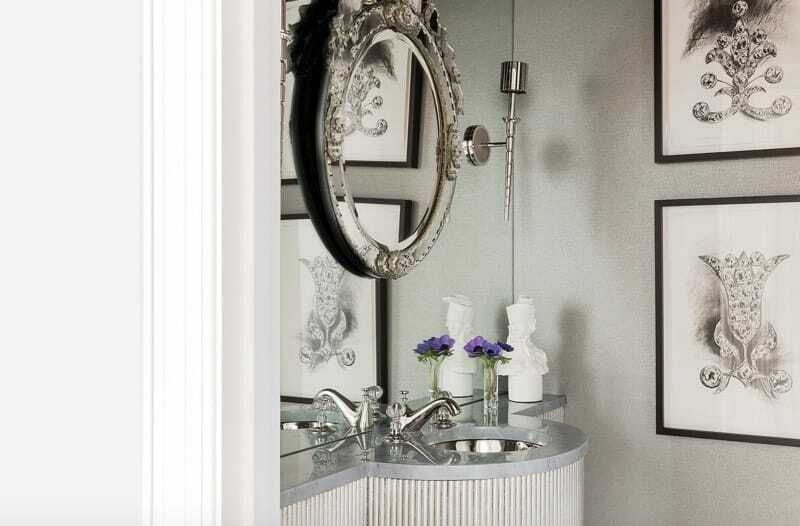 There’s a bit of vintage flair coming from the sink area as the subtle curves of the basin look attractive against the straight lines of the mirror and washstand. Another impressive choice is the decision to install a round window which seems to bring the vintage design together. 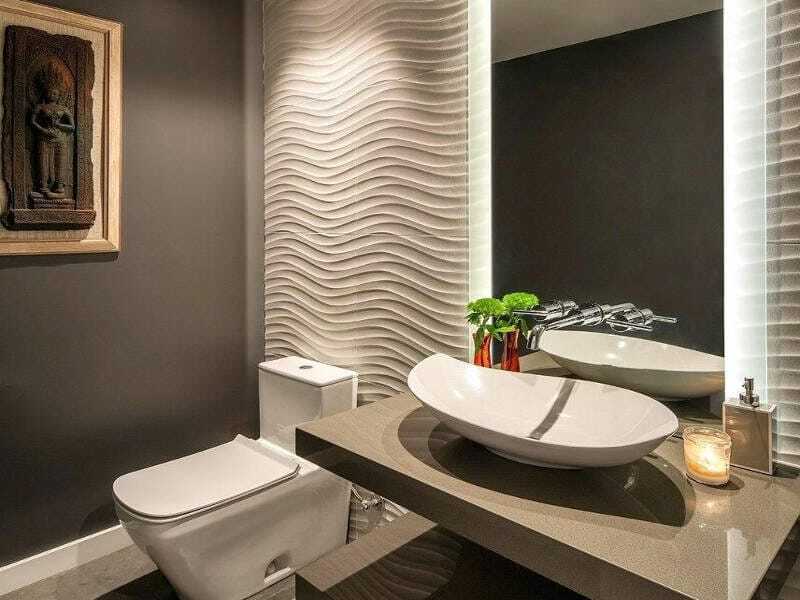 Powder rooms with a contemporary look tend to showcase some more innovative design elements. The asymmetric washstand here has a very attractive appearance as it comes encased in a marble slab, but there’s a portion of the countertop that’s left exposed. Thanks to this design choice, the overall sense of depth becomes enhanced. The stacked materials also give off some minimalist vibes. 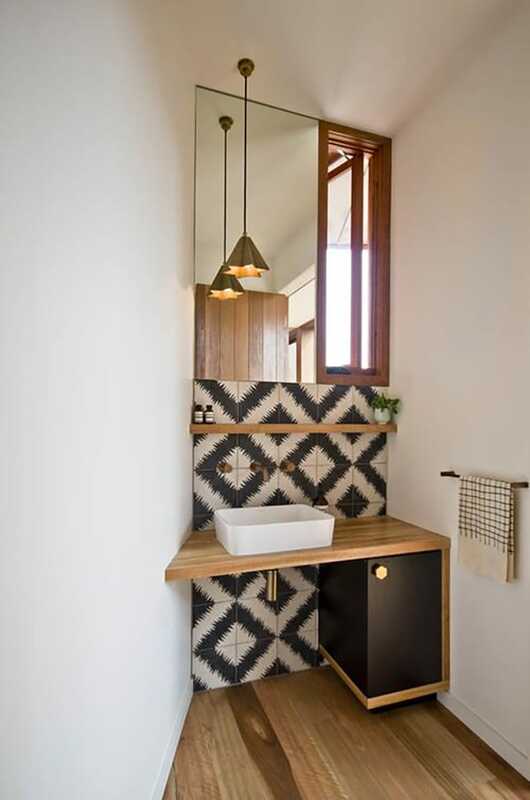 To keep things from looking too bland, there are some gold accents like the brass pendant light and towel stand. 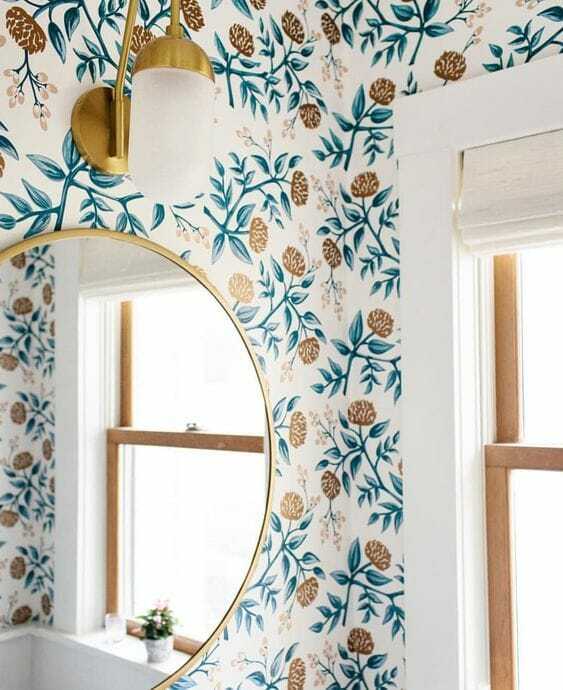 Finally, the energetic leafy wallpaper completes the modern style of this powder room. 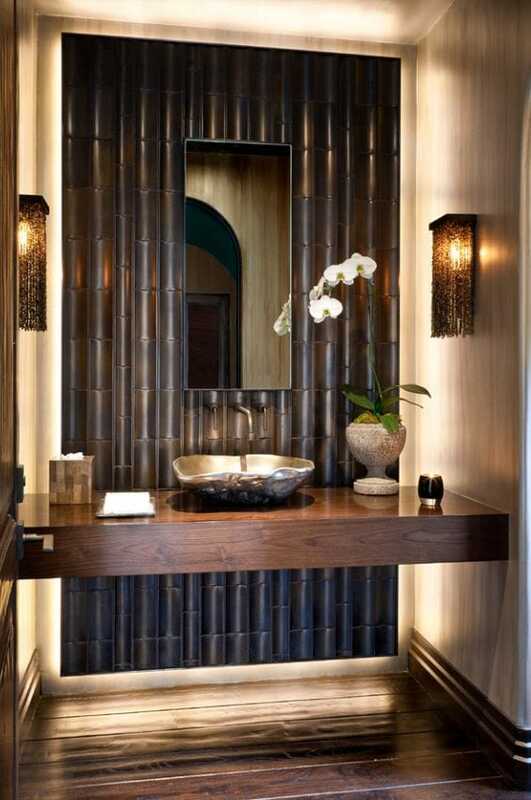 When you play with some dark and textural shades, the result can be a masculine-looking powder room. The addition of interesting decorations gives this half-bath a contemporary art vibe. The marble sink follows the same darker patterns as the wall and the large round mirror easily seems like a focal point in the room. For a unique look, the powder room needs to get infused with a vigorous amount of creativity. Lots of bright and dynamic elements are combined together here to create a one-of-a-kind half-bath that features a striking natural beauty. 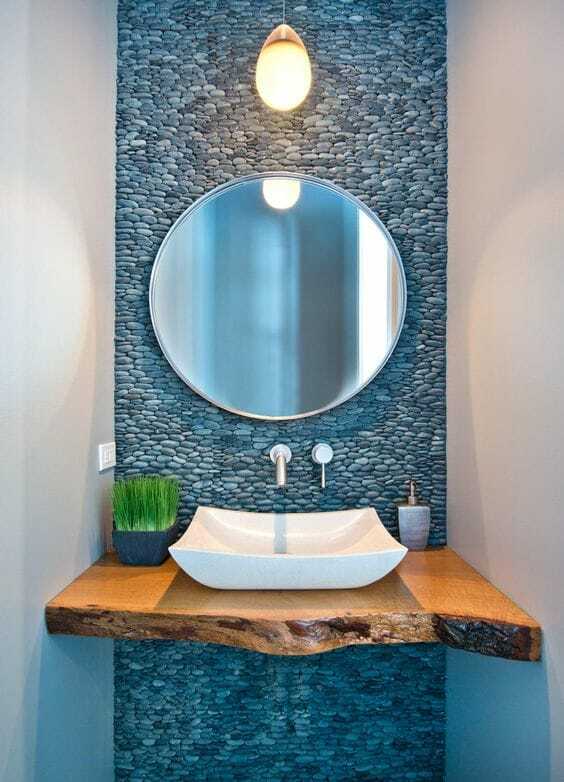 The Aegean blue pebbles on the wall create an ideal backdrop for the rough-edged wood countertop and round mirror. 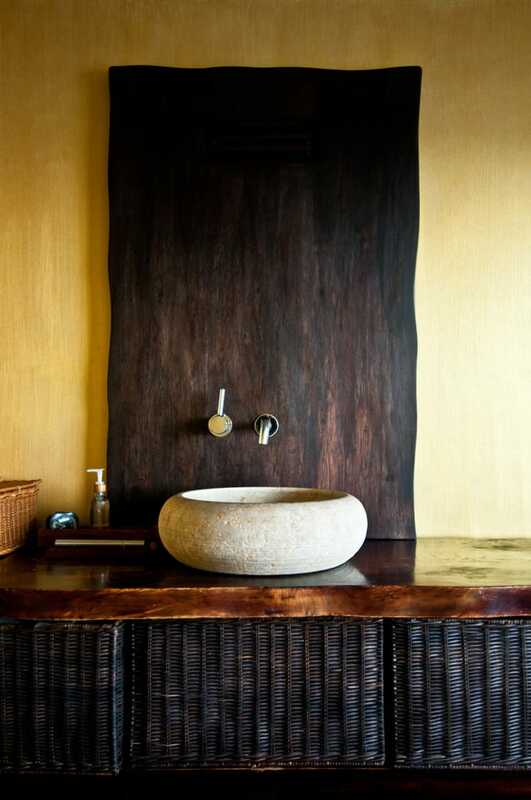 The delicate curves of the sink basin can easily take your mind to ocean waves and the little bowl of green grass near it represents a nice touch. 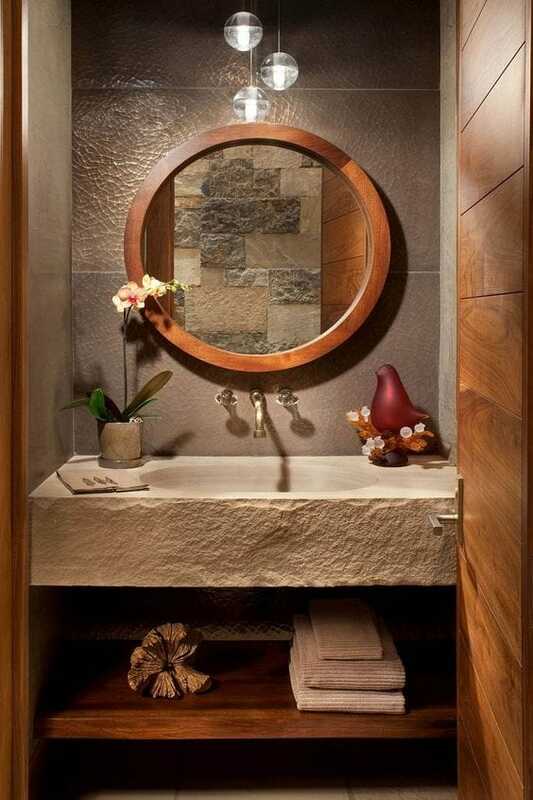 This is a simple yet gorgeous powder room with very memorable shapes, textures, and colors. 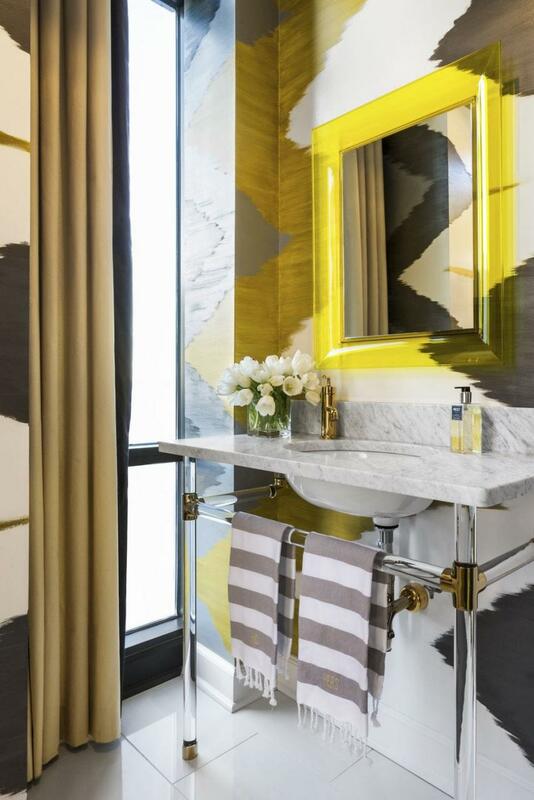 To give your powder room a modern twist, one of the best places to look for inspiration is the bathroom in a hotel. There’s no need to try to recreate the interior of a lush palace when you’re dealing with this kind of limited square footage. Therefore, you can use simple tricks like well-placed lighting to enhance the sense of space. Combined with an oversized mirror, the resulting visual effect can be quite dramatic. Don’t focus too much on filling up space in the powder room. It’s usually enough to place only a few meaningful decorations like a plant or an artwork. 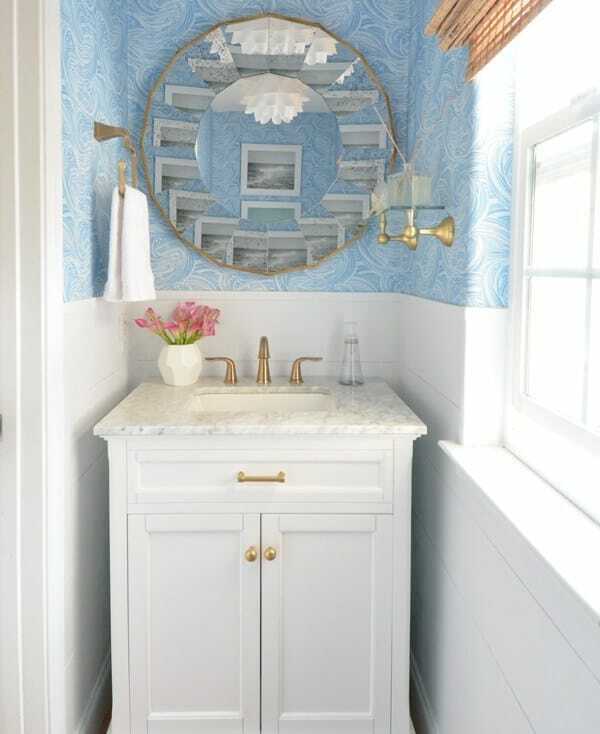 The powder room of your beach house can look amazing if you follow a relevant design theme. 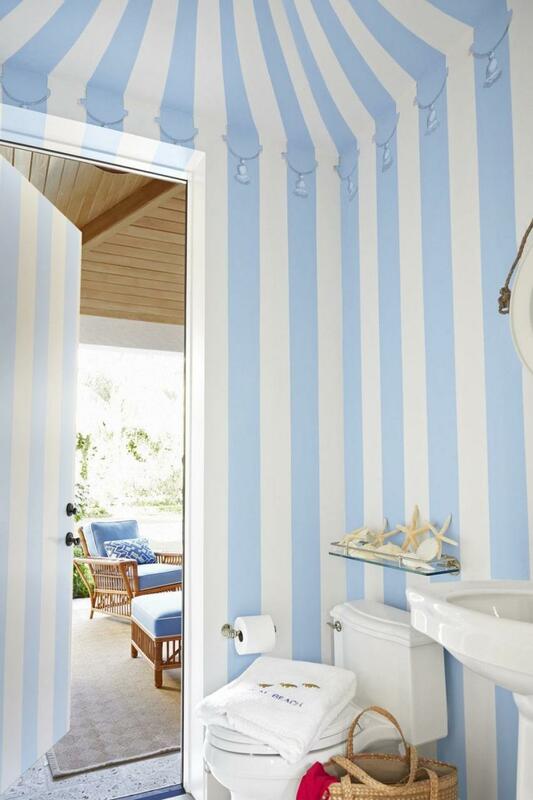 Summery blue and white stripes deliver some pleasant coastal vibes in this half-bath. It’s interesting to observe how they peak at the roof to boost the sense of depth. A simple yet effective way to trick the eye into seeing a loftier room. Having a main focal point in the powder room represents a smart way to grab the attention of your guests immediately. The vanity in this half-bath could be easily considered a statement piece, but the true highlight is the Lucite-framed mirror. It really stands out in the room as it adds a splash of cheerful yellow to complement the overall transparent theme. Sometimes it’s a good idea to keep the vanity’s purpose strictly an aesthetical one instead of storing unsightly items that impact the view. 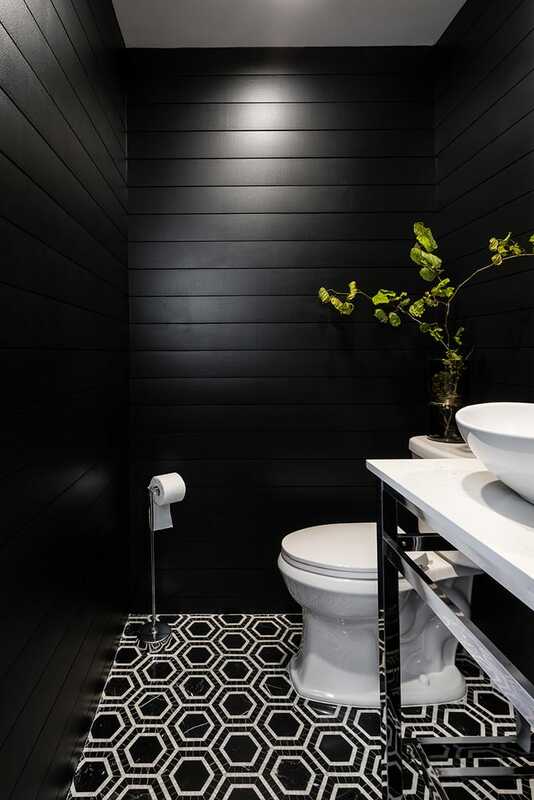 Black shiplap walls are elegantly complemented by the monochrome patterns on the floor. The geometrical design adds a bit of punch to the black and white color scheme of the room. This artistic tile floor needs to be properly showcased with the help of powerful lighting. This kind of floor pattern may feel a bit overwhelming in a small space like the half-bath, but we think it can look amazing with the right wall paint and accent pieces. 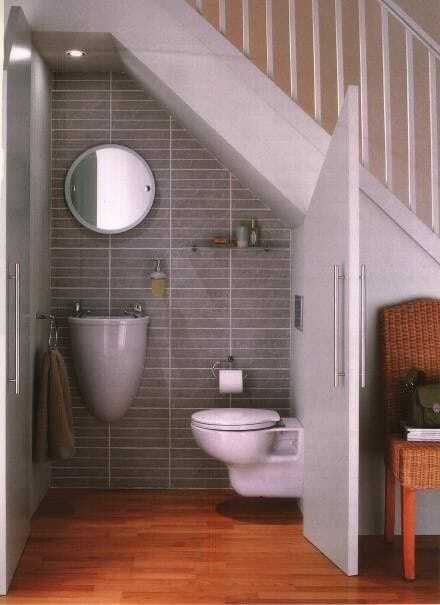 If you like the idea of having a powder room, but lack the extra room for it, consider choosing a more unusual spot in your house like the spot under the stairs. Remember that you won’t need a lot of square footage to create a stylish powder room. 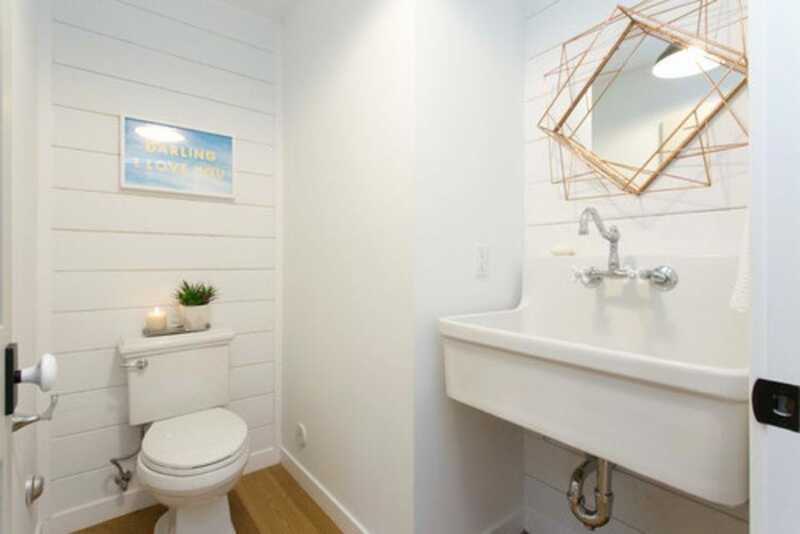 This is a fairly minimalist example given the wall-attached sink and floating toilet. It’s all about learning to work with the available space and creating a comfortable half-bath that’s both functional and charming. An inspired décor element is the pale grey tiling. There’s a very good reason for creating a gallery wall into your powder room. This place is mainly intended to be used by your visitors, so that presents a perfect opportunity to show off your personality. Fill that blank wall with all your favorite artwork pieces or photographs. Let the gallery on the wall tell a memorable story through its beautiful combination of frames and pictures. Instead of opting for a basic mirror when doing a powder room makeover, why not use the opportunity to refresh the look with a unique model? 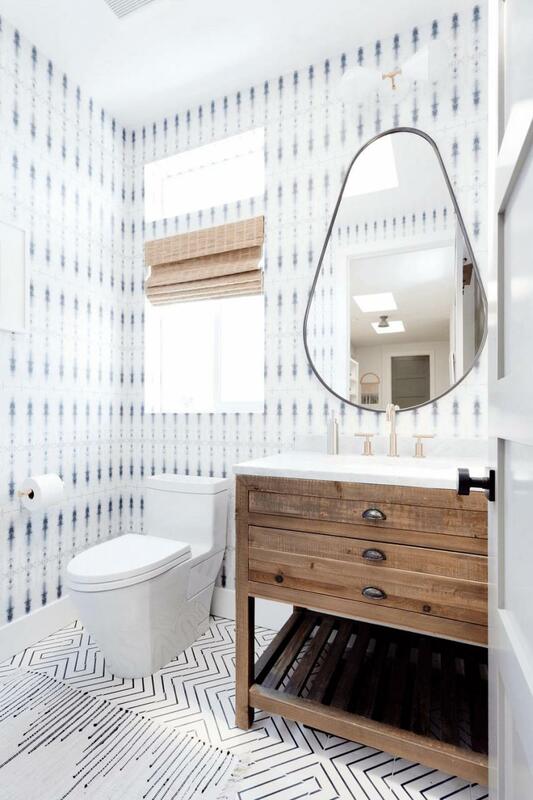 The mirror shown here fits the wall of this half-bath very neatly and offers a brilliant visual effect thanks to the blue wallpaper with wavy patterns. Golden touches are found throughout the small room on various elements forming a cohesive look and a stunning contrast with the blue and white dominant colors. While the lovely color palette draws a lot of attention, the gorgeous mirror is clearly the main focus of this powder room. 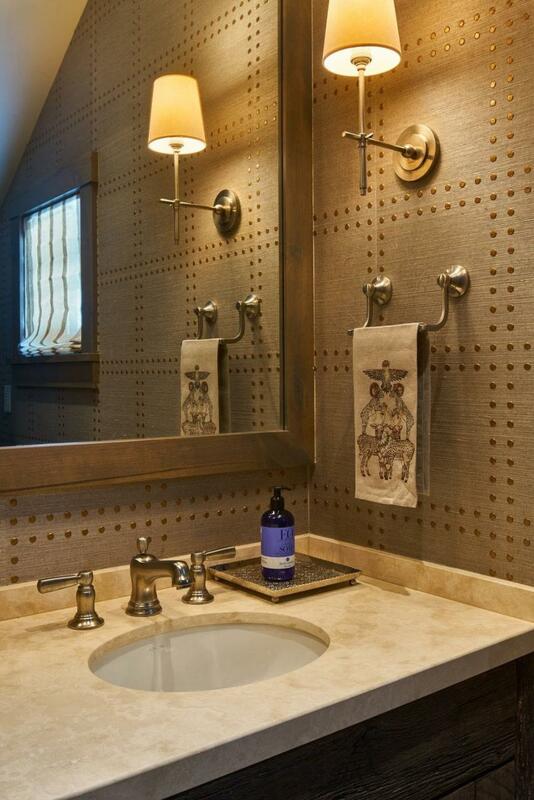 A simple element like a piece of chicken wire can bring some nice rustic style into any powder room. This half-bath seems quite modern otherwise, but the stacks of fresh white towels seen through chicken wire add a casual feeling that reminds you of the countryside. Modern-designed powder rooms can often feel a bit too intimidating. This problem can be solved if you choose to incorporate some more surprising accents. The blunt look in this powder room seems more welcoming with the help of a slim hanging mirror and wooden towel bar. There’s a recessed wall counter above the toilet that adds precisely the kind of refreshing and unexpected feeling needed to tame a modern design. 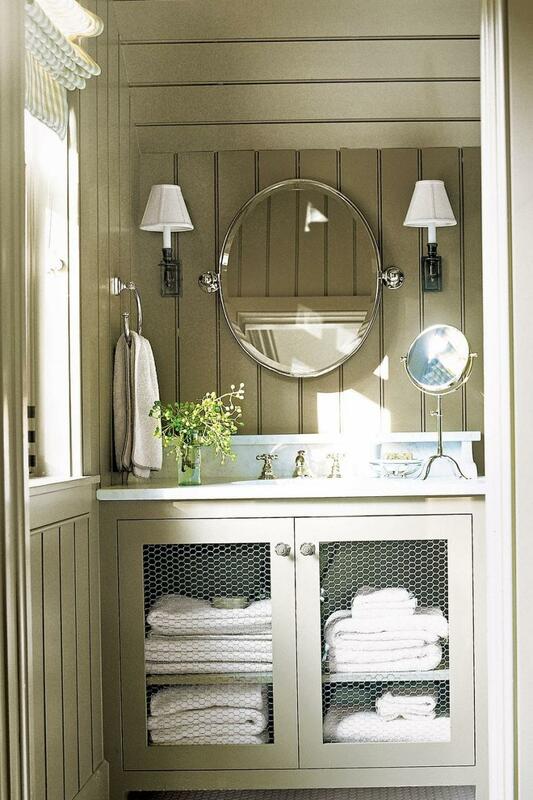 Powder rooms can easily borrow some classic spa elements to create a more reinvigorating area for your guests. This half-bath pictured here doesn’t really stand out at a first impression, but then you will notice all these little details that contribute to a captivating look. Smooth spa stones decorate the floor thanks to an interesting break in its design. For some relaxing vibes, flowers and live plants are placed on the countertop. 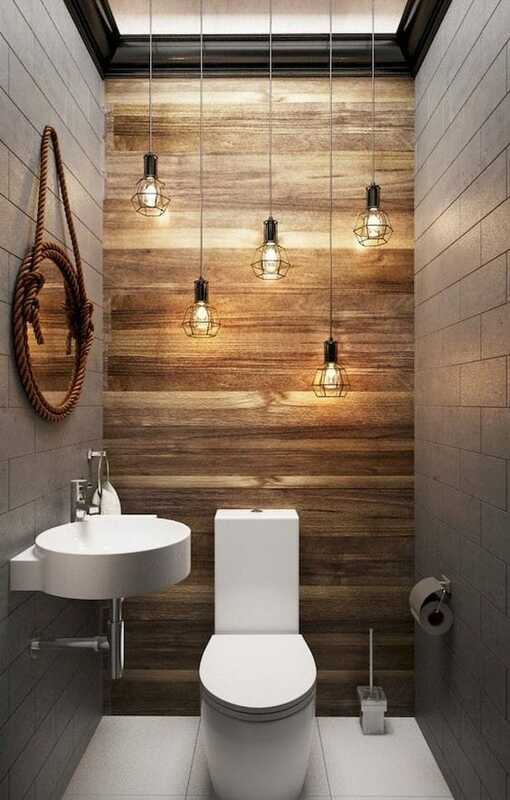 Subdued lighting together with the overall clean look transforms the powder room giving it a refreshing atmosphere. Playing with textures represents a powerful method to redesign a powder room in a unique way. When you need to work around a limited space, texture can suddenly become more important compared to other design elements. 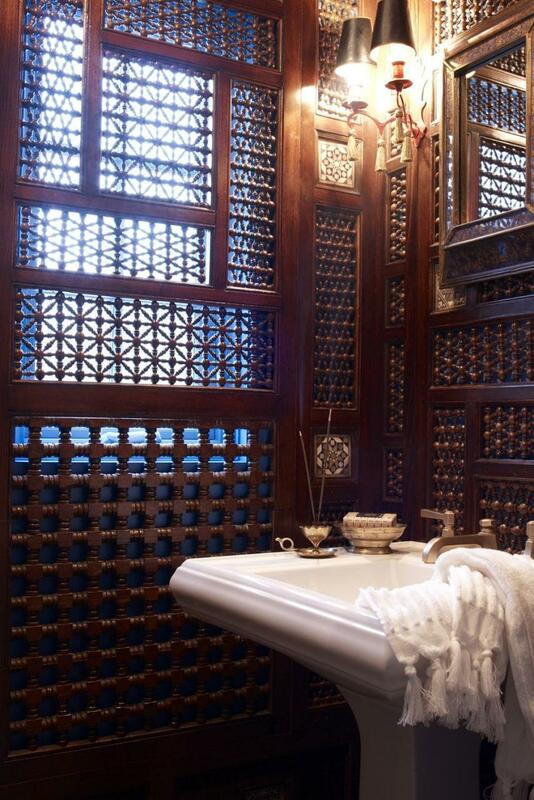 This exotic-looking half-bath has allover Moroccan fretwork that enables light to sneak inside for a stylish visual effect. The beautiful panels give this room an appearance that resembles an exotic jewel box. 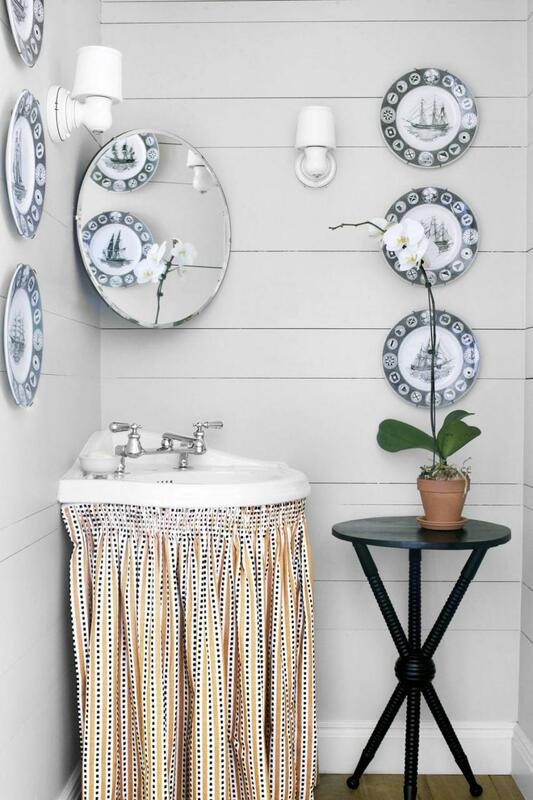 Just by giving this powder room a quick glance you will be immediately enchanted by its bohemian appeal. From the playful tile patterns to the minimalist furnishings and the neutral color scheme, everything is tied together in bohemian fashion. This is one creative way to transform an awkward space in the house in a functional and charming powder room. 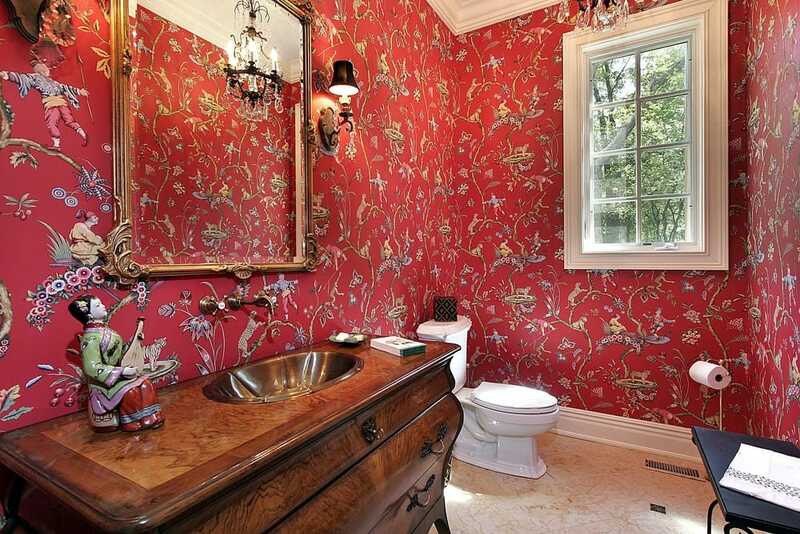 There are many vibrant colors in this powder room that compete for your attention. 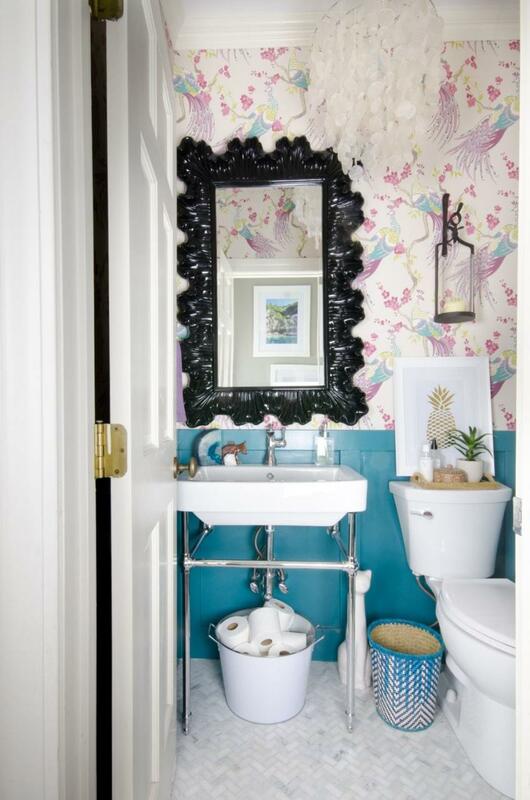 From the elegant black of the mirror frame to the turquoise paneling and patterned wallpaper full of rainbow colors, the palette makes this a youthful and eye-catching half-bath. The offbeat color style may not be suited for everyone’s tastes, but if you wish to add a more personal and uplifting touch, this represents a very inspirational idea. Any powder room can take advantage of the power of marble to become more elegant. This smooth material creates a fresh look wherever it’s placed and that’s mostly thanks to marble’s unique natural patterns. The cool air of marble can be warmed by adding some wood into the mix like a countertop. 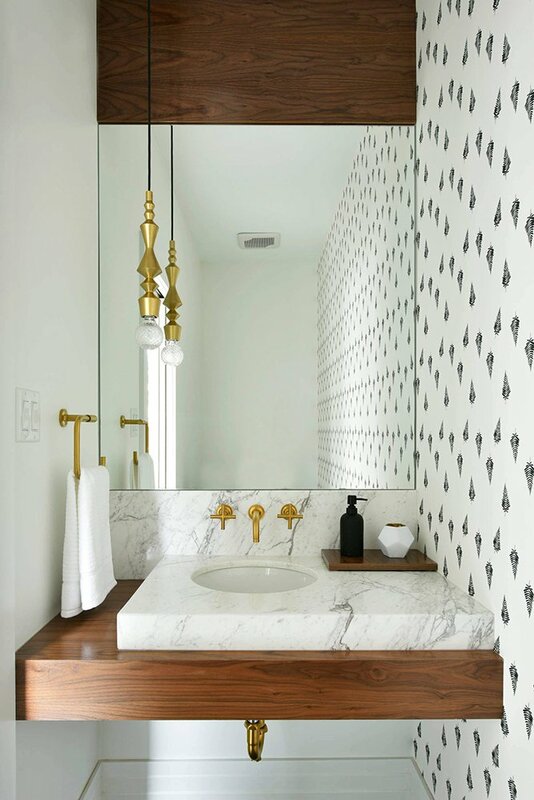 To make marble become the central point of attraction in the powder room, consider incorporating a mirror with a slim style and don’t forget about some solid ambient lighting. 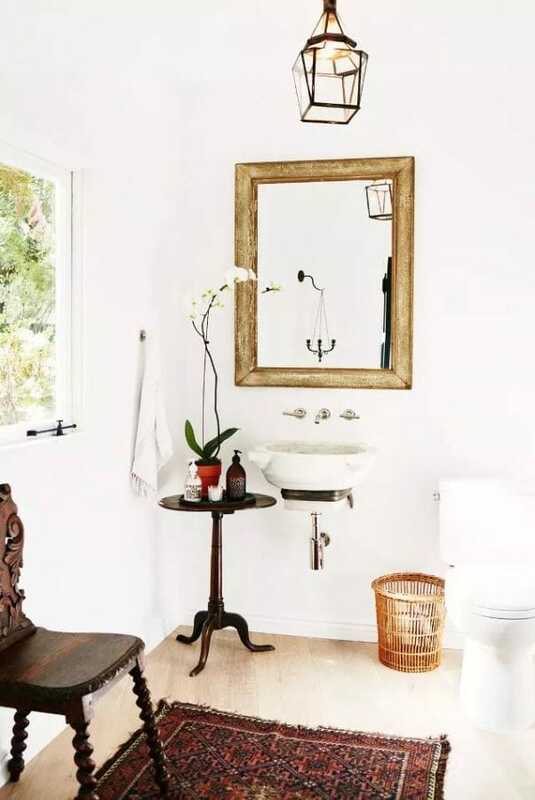 Tiny powder rooms can be practical to use if you try out some ingenious space-saving tricks. One solid idea is to use corners to your advantage. Placing a mirror and even the sink in the corner may not sound like a good idea, but this can be pulled off without too many issues. As long as you ensure that these elements have the right dimensions for the small room, you can maximize the space and enjoy an efficient powder room. To gain some storage space you can use a fabric skirt to hide items stashed under the sink. With the help of accents like the round table and plates on the walls, the overall impression is both practical and attractive. When you design a powder room, there’s no reason why you should be restricted to just one or two materials. By incorporating more materials in the same place, you can create a more interesting look and a better tactile impression. This gorgeous example integrates metal, porcelain, and acrylics that combine beautifully with the neutral color scheme. 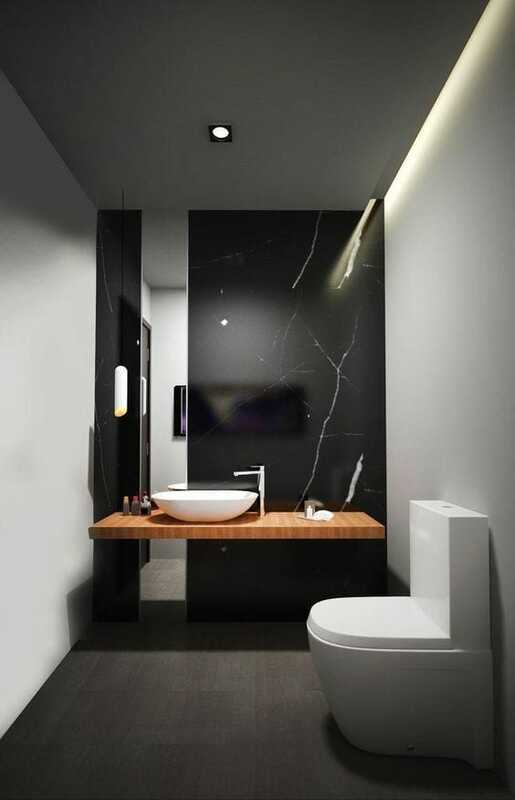 If you’re the kind of person that puts greater emphasis on the functionality of the room rather than aesthetics, you will probably like the efficient layout of this powder room. It has a fairly minimalist design with well-placed elements and accents to find the right balance between using up the available square footage and keeping the atmosphere light and airy. Details such as the towel bar placement or small sink basin represent wonderful additions for a scaled-down powder room where space efficiency matters the most. 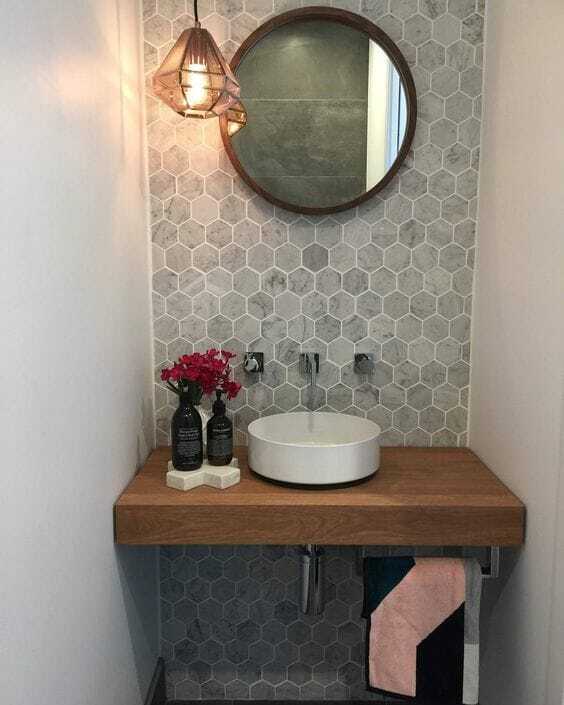 That doesn’t mean fashionable touches are neglected as evidenced by the presence of the honeycomb pattern on the wall and the copper lighting fixture. Balancing two opposite styles seems like an inspired idea if you wish to make a statement in the powder room. This half-bath manages to accomplish that as it combines a modern design with some rustic flair. A few well-placed accents can make a huge difference when it comes to bringing some charming vibes to the stark efficiency of modern elements. The powder room here looks modern at a first impression, but upon further inspection, you will notice the rustic details. The rope-framed mirror is one feature that stands out and the vintage drop lights contribute to the rustic effect as well. Another interesting element is the plank paneled wall that offers a trendy contrast against the blunt look of the modern walls. The ceiling in this powder room creates a dramatic effect thanks to the mirrored ceiling. There are stone and glass elements that seem to match the grand design pretty well. 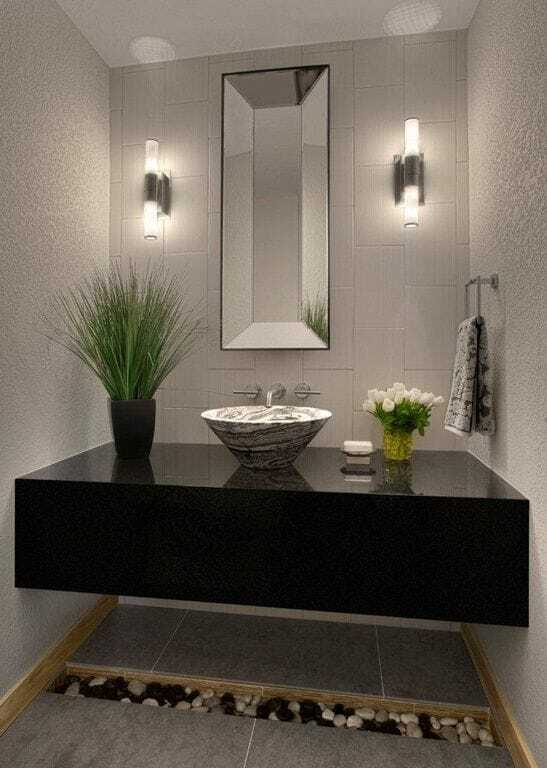 Lighting fixtures are strategically placed to put a better emphasis on the mirror surfaces and stone tile walls. 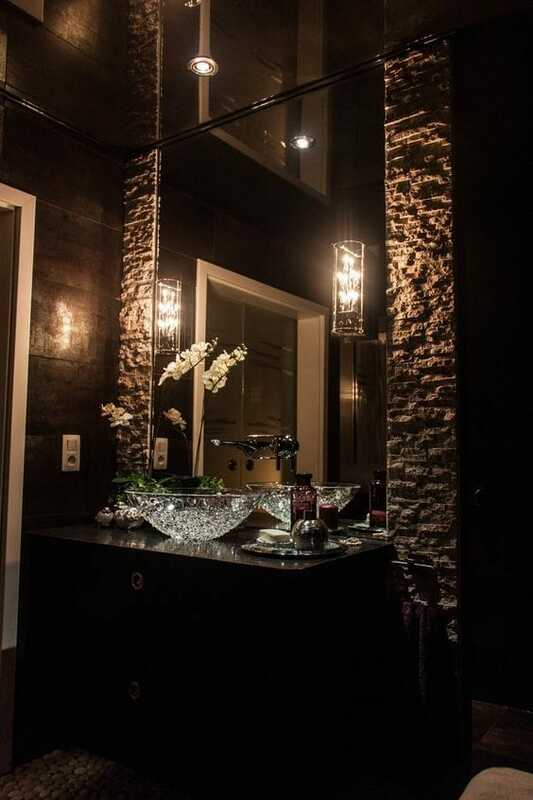 One of the main aspects of this powder room that makes it feel dark and imposing is the way the mirror extends to the ceiling. It enhances the sense of depth and space. To ensure that the overall look isn’t too overpowering for your guests, consider adding some delicate accents like the plant or the glass basin. 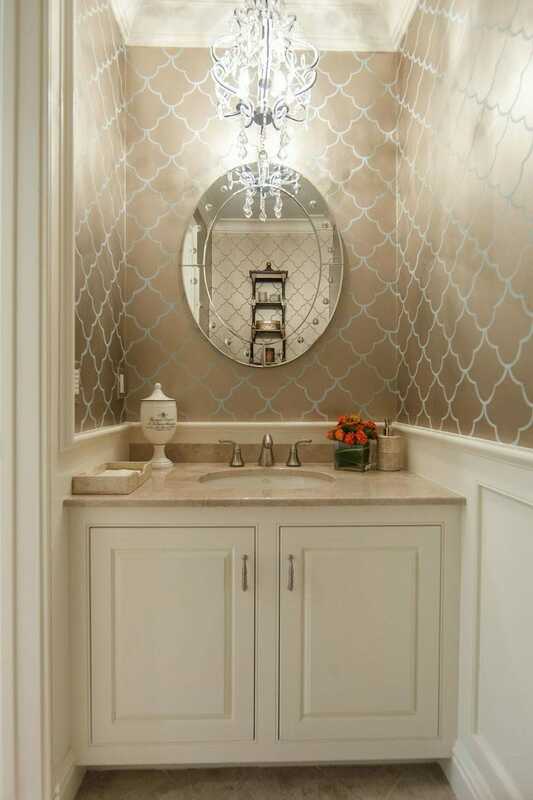 We’ve seen many powder rooms that evoke regal feelings thanks to their sophisticated and elegant looks. Those who prefer that kind of style, but with an interesting twist should check out this half-bath that offers a graceful design with alluring stone and wood elements. A monastic theme might take your mind to a very sparsely furnished room with some rough-looking elements. This powder room only borrows some key design features for a personalized look that never seems to go out of style. Rough stone combined with natural wood creates a unique design that delivers some charming medieval vibes while retaining some modernized aspects.